Doctor Who fans are to be plunged into one of the Time Lord's adventures in an "immersive" theatre show created by the acclaimed company Punchdrunk. Punchdrunk are famous for transforming entire buildings into mysterious locations which audiences explore as the action unfolds around them. They had kept details of their latest show The Crash of the Elysium, which opens in Salford on 30 June, secret. But it has now been revealed that will be based around the BBC time traveller. The show has been created with Doctor Who executive producer Steven Moffat. It is aimed at children aged six to 12, who will "become the stars of an exhilarating live Doctor Who adventure", according to its website. Punchdrunk have previously created theatrical experiences based around works by Shakespeare, Chekhov and Goethe, and are currently in New York staging a version of Macbeth, which has been extended after earning rave reviews. They have become known for creating eerie worlds in disused warehouses, factories and army barracks. The Crash of the Elysium is part of the Manchester International Festival and will take place in less dilapidated surroundings, in part of the BBC's new MediaCity UK building on Salford Quays. Children will move through the set in groups of 25. The website says: "Like any Doctor Who episode, children will find this event both scary and exciting." Punchdrunk, led by artistic director Felix Barrett, will put on children-only performances and family performances, where grown-ups can accompany the youngest fans. But adults will not be admitted if they are not with a child. Two mock blogs give clues to the plot. One recounts the sinking of a ship, The Elysium, which was said to be carrying gold, industrial machine parts and secret government cargo in 1888. The other is the present-day diary of a diver called Daryl who has salvage rights to the wreckage. 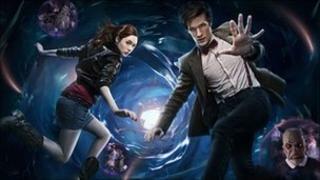 About 5.5 million people watched Saturday's episode on BBC One, which marked the start of a mid-series break. The series will resume with an episode called Let's Kill Hitler in the autumn.